The Crown Prince of Abu Dhabi has hailed His Highness Sheikh Mohammed bin Rashid Al Maktoum, Vice-President and Prime Minister of the UAE and Ruler of Dubai, as a "teacher, inspiring leader and partner in the development process". "Our nation is proud of you. Your values and talent inspire all Emiratis. From your approach, we learn the values of giving and life wisdom," tweeted His Highness Sheikh Mohamed bin Zayed Al Nahyan, Crown Prince of Abu Dhabi and Deputy Supreme Commander of the UAE Armed Forces. He tweeted a series of messages in response to Sheikh Mohammed bin Rashid dedicating his 12th accession day anniversary (January 4) to thanking the former. "When we talk about ambition and optimism, we have to mention brother Mohammed bin Rashid. He is a practical thinker who devoted his time and effort to serve our nation and to support its vision with good planning and organisation," Sheikh Mohamed bin Zayed tweeted. "Together, we will prove to the world that the impossible is possible and that our nation deserves our sacrifices. We will create a model of optimism that sets our homeland where it should be. I congratulate you on being a leader to be proud of." Sheikh Mohamed bin Zayed also reaffirmed his "full confidence in the abilities of the UAE people". "To all civil servants, workers, soldiers, teachers, students, fathers and mothers, I say thank you. Thanks to everyone who made the UAE his second home." On Tuesday, Sheikh Mohammed bin Rashid had called on the Emirati people to offer their thanks to Sheikh Mohamed bin Zayed for devoting his life "to raising the stature of the nation and ensuring the happiness of citizens". He issued directives not to allocate celebratory events to mark his accession day anniversary. He urged the people to instead use the occasion to show gratitude to Sheikh Mohamed bin Zayed "with a meaningful word, or an inspiring picture, or a good act". Sheikh Mohammed wrote on his Twitter account: "I thank him in the name of my people, not my name. Not for something personal, but for a great country he makes for its new generations." "Thank You, Mohamed bin Zayed, for supporting the youth, for teaching generations how to serve the country, for inculcating heroic spirit in them." He also penned a heartfelt letter titled 'Thank you, Mohamed bin Zayed', which he shared on social media. 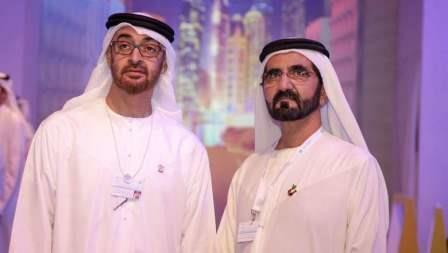 "Only a few know that he (Sheikh Mohamed bin Zayed) works 18 hours a day for the UAE. Only a few people know that his annual holiday is less than a week. Only a few people know that millions of children around the world benefit from his goodness and giving that he provides quietly. "Thank you for your investment in education; thank you for the good living conditions of our people. Thank you for dedicating your life to this great nation," Sheikh Mohammed bin Rashid wrote. From poems to personal messages dedicated to the Rulers, UAE residents have responded in large numbers to the call of His Highness Sheikh Mohammed bin Rashid Al Maktoum, Vice-President and Prime Minister of the UAE and Ruler of Dubai, to thank the Abu Dhabi Crown Prince. Khaleej Times spoke to some Emiratis and expats to understand what this call to express gratitude to His Highness Sheikh Mohamed bin Zayed Al Nahyan, Crown Prince of Abu Dhabi and Deputy Supreme Commander of the UAE Armed Forces, means to them. Haneef Hassan, an Emirati, said Sheikh Mohammed bin Rashid teaches people how to express appreciation and gratitude to leaders. "Sheikh Mohamed bin Zayed is an honourable role model owing to his dedication and sincere services to the nation." Mohammed Ibrahim, an Emirati news anchor, said Sheikh Mohammed bin Rashid gives "us lessons on how to be loyal to the nation and the prudent leadership". "Sheikh Mohamed bin Zayed is a great leader who reminds us of the immortal legacy of the late founding father, Sheikh Zayed bin Sultan Al Nahyan."